I need toautomate across my infrastructure. Task and process automation across your environments. Maximise your investments with connectors. Modern ITSM cuts out heavy lifting. Are you under pressure to show value from new investments? Feeling the squeeze of shrinking budgets and charged with reducing maintenance costs? You need to focus on innovation and driving transformation. What’s holding you back are the reoccurring manual tasks, disjointed systems, and lack of visibility. Opportunities to automate processes and connect apps and systems are all around. With automation, you can focus on more strategic projects, save costs, and maximise investments. If organisations invest time and money into major systems, they should be interconnected to get the most ROI possible. Without integrated reporting to understand their environments, IT teams can’t fully leverage automation. Automation is key to ensuring agility and flexibility needed to quickly spin up cloud resources quickly. Manual processes have no consistency controls, making them error prone and creating potential vulnerabilities. Manageing service requests manually is difficult and leads to slow delivery times and frustrated users. Bring systems together with automation. By connecting systems with powerful automation that is flexible enough to adapt to changing business processes, IT teams can see value faster than ever before. Automate routine and re-occurring tasks across endpoints and infrastructure. Fully automated ITSM in the cloud or on-premise. Automatically provision and de-provision resources based on user identity and attributes. 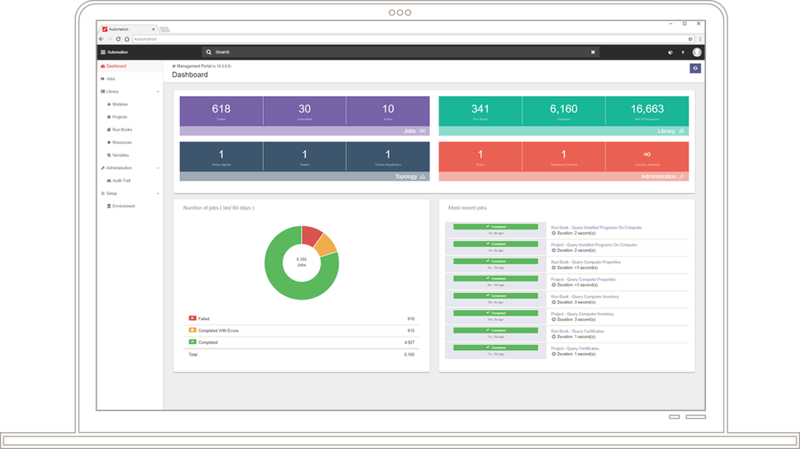 Consolidated IT Dashboards and reports give you insights into which systems to automate. Throw out the spreadsheets and say goodbye to inconsistencies and errors. Deliver faster, higher quality IT services to users. Allow users to request services that are delivered instantly based on approved workflows. Design and run automated processes based on logic and approvals. Create and execute single or multi-step tasks across systems, in parallel. Automate and integrate across your systems to save time, increase security, and reduce costs.